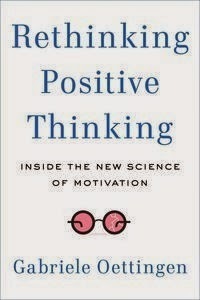 In a new book, Rethinking Positive Thinking: Inside the New Science of Motivation, Gabriele Oettingen of NYU summarizes twenty years of research she has done together with her collaborators. This research has focused on the functions and effects of positive fantasies and of a technique called mental contrasting. Positive fantasies have several benefits and limitations. Let's start off with some benefits. One benefit is that they may distract us when we have to do a boring task of when we have wait thus making it easier to pass the time. Another benefit is that positive fantasies give us pleasure. When we vividly imagine a desired future, we can mentally explore and enjoy this future without having to take action and make an effort. As research has shown, we are remarkably capable of fooling our brains into believing that the fantasy is a reality. Thus, we can experience the fantasy as if that dream has to some degree actually come true. Because of this, fantasizing can calm us down, make us feel relaxed, and feel good and satisfied. Therefore it is no surprise that positive fantasies can also alleviate depressive symptoms, albeit only for a brief time. Now let's look at some limitations or downsides of positive fantasies. Contrary to what many people believe, positive fantasies decrease our energy to perform the hard work of meeting real life challenges which are involved in accomplishing challenging goals. As we are fantasizing, we to some extent, fool our brains into thinking we have already achieved, to some extent, that desired future. Because of that fantasizing becomes a substitute for doing. Instead of become energized for action, we become relaxed and unprepared to act. Mental contrasting is a technique in which fantasizing about the desired future is combined with visualizing the obstacles that stand in our way. In mental contrasting, the individual first visualizes the desired future and after that the obstacles. The other way around (first obstacles, then desired future) does not work. By first visualizing the desired future and then the obstacles, mental contrasting may cause the desired future and the challenging reality to become connected. 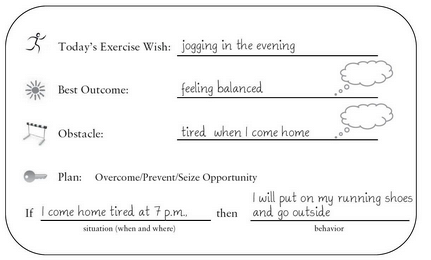 But mental contrasting does not always energize for action. It only does so when the individual views the desired future as realistic and achievable. When the individual views the desired future as unrealistic, unachievable, mental contrasting leads to letting go of that goal. Thus, with realistic goals, mental contrasting energizes for action; with unrealistic goals, it helps individuals to let go of that goal, thereby sparing their resources for other, more realistic goals. In the book you can find many examples and exercises. Mental contrasting works even better when combined with a technique called implementation intentions (sometimes referred to as if-then planning). Implementation intentions are clear agreements with yourself to behave in a specific goal-oriented way in a specific challenging situation (i.e. when dealing with an obstacle). In other words, you say to yourself: "If X happens, I will do Y." The power of implementation intentions is that the situational cue will start to control your response, causing it to happen immediately, as if by reflex. Research has revealed that the combination of mental contrasting and implementation planning works better than using either of them alone. WOOP is a content-neutral technique. It can be used in a variety of types of problems and the number of research studies showing its efficacy is increasing. If you try it out, I'd appreciate to hear how it worked for you. I have learned that if you are depressed or sad, best to do is embrace it, go in to that feeling, be nice to the feeling, not angry, and you will notice that it will disolve like snow in the sun. Not always, but often it works. No side effects, no 'after' depression. Agree. Acknowledging negative feelings (both within yourself and in other people)can often be helpful and forced positivity seldom is. I also like the emphasis you place on being nice, not angry. There is a psychological literature on self-compassion which suggests something similar.